Yorkshire captain Andrew Gale with the County Championship Division One trophy at Lord's. WE have all been mourning the death of Brian Close this week and he will be remembered as a legend in Yorkshire and England cricket. With the way he played his cricket, it is something that I have tried to model my game on and with the toughness of the team he created. The lads have all called me ‘Closey’ a few times and that is the way I want to play my cricket; just like him. He stuck his chest out and stood up and was counted and was a role model to all his team-mates and an excellent captain as well. I was lucky enough to sit with him at a few dinners and share a few tales. He was known for his toughness, but I think he mellowed as he got older, apparently, and I used to love listening to his stories. Given everything this week, setting the first division points record in the County Championship after beating Hampshire this week was terrific for us at Yorkshire. It would have been disappointing to come this far and fall at the last hurdle and not get the record. I now want us to hammer it home next week against Somerset and I want us not to just go past it, but really go past it and set a record that is going to be there for a lot of years to come. 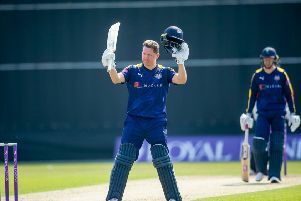 Personally, I was delighted with my century against Hampshire as I was disappointed to miss out at Lord’s on three figures after getting so close and playing a pretty ordinary shot in the previous match. I wanted to make a big contribution and chasing that total down gave the team a lot of focus which had been missing since we were crowned champions. We spoke about it and it was missing a little bit. The target focused the lads and I was happy to play a captain’s innings. Fair play to Hampshire for playing ball and forfeiting their second innings and setting us a target on the final day. You have got to be in it to win it and the way the points system works, you have to be prepared to lose in order to win games. If you win one, rather than draw two or three, it sets you apart. I thought when we were washed out for a full day that we might have a chance on the next morning of maybe putting something together. But I thought it would have to be on my terms and the team’s really. I said to their captain that we were champions and had nothing to chase and luckily enough, they wanted to set up a game as well and with a bit of negotiations, we came to a couple of declarations and us chasing 300. I thought it would be achievable. But when we were 30-3, then you are thinking it’s uphill from there. However, it was a good partnership between me and Jack (Leaning) to set the game up nicely. On the morning, it would have been easy for us to sit back and draw the game and let it take its course. But I said to the lads that we have always played that positive, attacking brand of cricket and if you live by the sword, you have to die by the sword. I said that if we rolled our sleeves up, we could get something out of the day and that’s exactly what happened. It’s our final game of the season next week and I am not going to lie; there’s some tired bodies around physically and mentally. I think the emotion of winning it at Lord’s means there’s some tired lads and we have done 320 overs in the field in the last six or seven days. But that said, we get a few days off before we are back in and we can hit the ground running again and put everything into those last four days and then get our feet up and recharge the batteries. Onto the England squad for the tour againat Pakistan in the UAE and I have got to say I was disappointed that Adam Lyth and Gary Ballance didn’t get a place. I was disappointed for them both; particularly Gary. I would have liked to have seen Adam get an extended run in the side, although I can sort of see why he didn’t get picked in the end. But Gary’s record speaks for itself. He’s got four hundreds in 15 tests and he has a fantastic record and he’s just been dismissed. It will be disappointing not to see him on that tour.